We just held our tenth and final week of the Hacking for Defense class. Today the eight teams presented their Lessons Learned presentations. We’re a little stunned about how well the first prototype of this class went. Over half the student teams have decided to continue working on national security projects after this class. Other colleges and universities have raised their hand and said they want to offer this at their school. What Were Our Goals for this Class? We had five goals for the class. First was to teach students to develop the mindset, reflexes, agility and resilience an entrepreneur needs to make decisions at speed and with urgency in a chaotic and uncertain world. Second, we wanted to teach students entrepreneurship while they engage in a national public service. Today if college students want to give back to their country they think of Teach for America, the Peace Corps, or Americorps or perhaps the US Digital Service or the GSA’s 18F. Few consider opportunities to make the world safer with the Department of Defense, Intelligence Community or other government agencies. Third was to teach our sponsors (the innovators inside the Department of Defense (DOD) and Intelligence Community (IC)) that there was a methodology that could help them understand and better respond to rapidly evolving asymmetric threats. That if we could get teams to rapidly discover the real problems in the field using Lean methods, and only then articulating the requirements to solve them, could defense acquisition programs operate at speed and urgency and deliver timely and needed solutions. Fourth, we wanted to show our DOD/IC sponsors that civilian students can make a meaningful contribution to problem understanding and rapid prototyping of solutions. Fifth, we wanted to create the 21st-Century version of Tech ROTC by having Hacking for Defense taught by a national network of 50 colleges and universities. This would give the Department of Defense (DOD) and Intelligence Community (IC) access to a pool of previously untapped technically sophisticated talent, trained in Lean and Agile methodologies, and unencumbered by dogma and doctrine. At this size the program will provide hundreds of solutions to critical national security problems every year. The result will be a network of thousands of entrepreneurial students who understand the security threats facing the country and engaged in partnership with islands of innovation in the DOD/IC. This is a first step to a more agile, responsive and resilient, approach to national security in the 21st century. What Did We Learn From the Class? Not only did the students learn, but the teaching team got schooled as well. First, we validated that students were ready and willing to sign up for a class that engaged them in national service with the Department of Defense and Intelligence Community. We had more applicants (70+) for the 32 seats in this class than we usually get in our core entrepreneurship class. Second, we found that the islands of innovation inside the DOD and IC were willing to engage this new and eager pool of talent. We were soliciting 8 problems for the students to work on and had to shut down the submission process after we reached 25. Third, some students took the class because they thought learning entrepreneurship with tough real-world problems would be interesting. We surveyed their motivations before and after the class and were surprised to find that a large percentage became more interested and engaged in national service. Over half the student teams have decided to continue working on national security projects. Fourth, other schools have said they want to offer this class next year. To help kick this scale into high gear, the National Defense University will be funding Hacking for Defense at colleges and universities across the country. 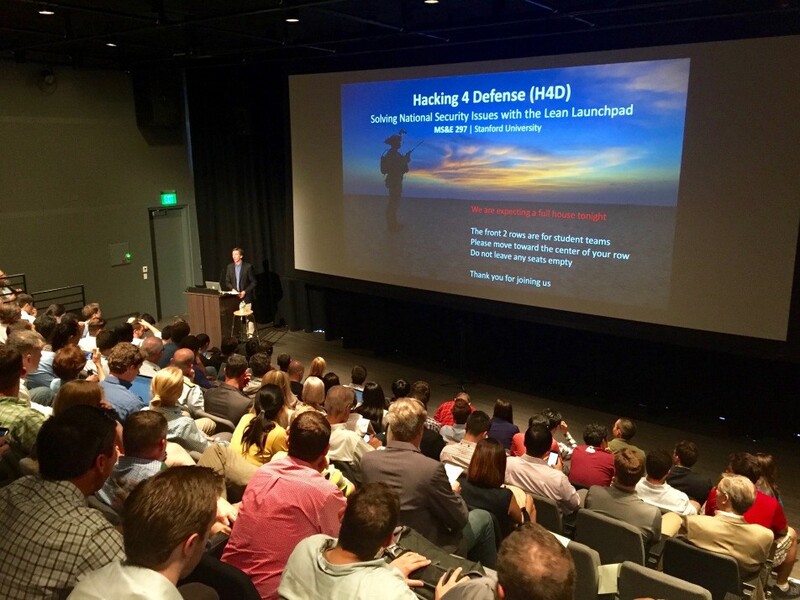 To train other educators and future problem sponsors we we will hold our first Hacking for Defense/Diplomacy Educators Class September 7 through 9th. Contact Pete Newell peter.newell@gc.ndu.edu to sign up. Finally, the teaching team (instructors, TA’s, mentors) and students debriefed on our own Lessons Learned from the class. Joe Felter and his research assistants will spend the summer building out the formal educator’s guide (capturing all the “wish we would have known’s” and “here are the points you need to make in this lecture”,) sponsor guide (yep, we learned we need to train our sponsors as well), creating new DOD/IC-specific video lectures. And we will build a knowledge base of DOD/IC acquisition primers, customer development best practices, org charts, etc. Finally, for universities interested in running future courses, HackingForDefense.org will act as a central clearing house for student-ready problems that have been vetted and unclassified. While H4Di.org gets on its feet Pete Newell and his team of RA’s will continue to source problems for upcoming H4D courses. The combination of the Mission Model Canvas and the Customer Development process was an extremely efficient template for the students to follow — even more than we expected. Insisting that the students keep a weekly blog of their customer development activities gave us insight into their progress in powerful and unexpected ways. Train the sponsors on commitment, roles, etc. Decide how we want the teams to split their time for potential dual-use products. How much time spent on focusing on the sponsors particular problem versus finding a commercial market. And what week to do so. Pete Newell is a former retired Army Colonel currently a Senior Visiting Research Fellow at the National Defense University’s Center for Technology and National Security Policy and CEO of BMNT Partners. Kim Chang was our lead teaching assistant. We were lucky to get a team of 25 mentors (VC’s and entrepreneurs) who selflessly volunteered their time to help coach the teams. Of course, a huge thanks to the 32 Stanford students who suffered through the 1.0 version of the class. And finally a special thanks to our course advisor Bill Perry, former Secretary of Defense and Professor Emeritus, Chris Zember, Director, National Defense University — Center for Technology & National Security Policy, Jay Harrison, Director, National Defense University — National Security Technology Accelerator, Dr Malcolm Thompson, the executive Director of NextFlex, the Flexible Hybrid Electronics Manufacturing Innovation Institute, The entire Defense Innovation Unit Experimental (DIUX), Center for International Security and Cooperation (CISAC) in the Freeman Spogli Institute for International Studies, STVP in the department of Management Science and Engineering. Hacking for Defense will be offered again at Stanford University next Winter. See you there! Read more Steve Blank posts at steveblank.com.